Tescoma HOME PROFI is a cookware set that will make your cooking a piece of cake. 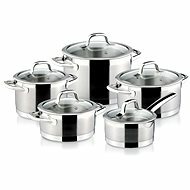 This nine-piece set is made of high-grade stainless steel with a high chromium and nickel content. Such high-quality material ensures a long service life, resistance to corrosion and great mechanical properties that will satisfy even the most demanding chefs. 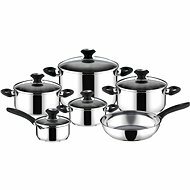 The set contains two pots with lids, two saucepans with lids and one small saucepan. 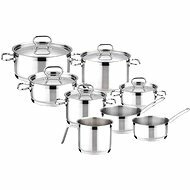 Each of these pots and pans features a thick stainless steel sandwich base. This is ideal for even distribution of heat, leading to even cooking and thereby preventing excessive burning. Because the material retains heat, it also allows for a more economical, energy-saving preparation of meals. When you turn off the stove, the residual heat will keep things cooking. Not only is Tescoma HOME PROFI a very practical set of cookware, with pieces you will find yourself using daily, but it also looks great. The high-gloss exterior surface is almost mirror-like, whereas the inside surface comes in a matte finish. For easy and safe use, the pots and pans are equipped with wide, sturdy handles that are designed to stay cool even during extended stovetop use. Because those are also made of stainless steel, the cookware is dishwasher-safe and can be used in an oven. It is also compatible with all types of stoves.? For shipping to other EU countries visit this page Tescoma HOME PROFI 9 pieces. Für Versand nach Deutschland, besuchen Sie bitte Tescoma HOME PROFI 9-teiliges Set. Chcete doručit zboží do Česka? Prohlédněte si Tescoma Sada hrnců HOME PROFI 9ks 725009.00. Chcete doručiť tovar na Slovensko? Prezrite si Tescoma Sada HOME PROFI 9 dielov. Für Versand nach Österreich, besuchen Sie bitte Tescoma HOME PROFI 9-teiliges Set. Magyarországra történő kiszállításért tekintse meg ezt a termékoldalt: Tescoma HOME PROFI, 9 darabos.